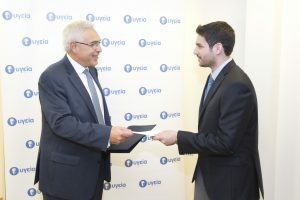 Honors medical graduate Spyridon-Panagiotis Basourakos from the Ioannina University School of Medicine received a ‎€10,000 scholarship during a special ceremony at HYGEIA Hospital. The scholarship was dedicated to the memory of the late general surgeon Panagiotis Sakellariadis. The procedure for selecting the scholarship holder among all the potential candidates was conducted based on the terms and conditions set out in the relevant announcement issued by HYGEIA, with Mr Basourakos ranking at the top among all HYGEIA graduates for 2014. The ceremony was attended by representatives of the HYGEIA administrative and medical staff. The Hospital CEO, Mr Andreas Kartapanis, awarded the €10,000 scholarship to the honors graduate, who thanked the Hospital Management for their kind offer. He further voiced the belief that this initiative would attract many more followers. Mr Basourakos is waiting to begin his specialty (general surgery), while he is already working as a Postdoctoral Research Fellow with a US University medical center. He is also planning on pursuing a PhD on his surgical specialty.